Ever since human civilization's mastery of electricity and our subsequent reliance upon it, flashlights and batteries, candles and matches have been universally adopted as the essential cornerstone of our emergency kit, when threatened with a power outage. And rightfully so, for hundreds of years, it has been essential to our survival to store these items in a designated location within our dwellings for easy access at those critical times. So important are these staples during an emergency that the store shelves get emptied out and we are hardly concerned about their high cost when using them up and then purchasing them over and over again. Today, the introduction of portable solar power technology has finally offered us an "evolutionary upgrade" in the form of an All-In-One Portable Solar Powered Lighting System & Power Bank. An upgrade technologically, economically, environmentally and most importantly, in convenience. 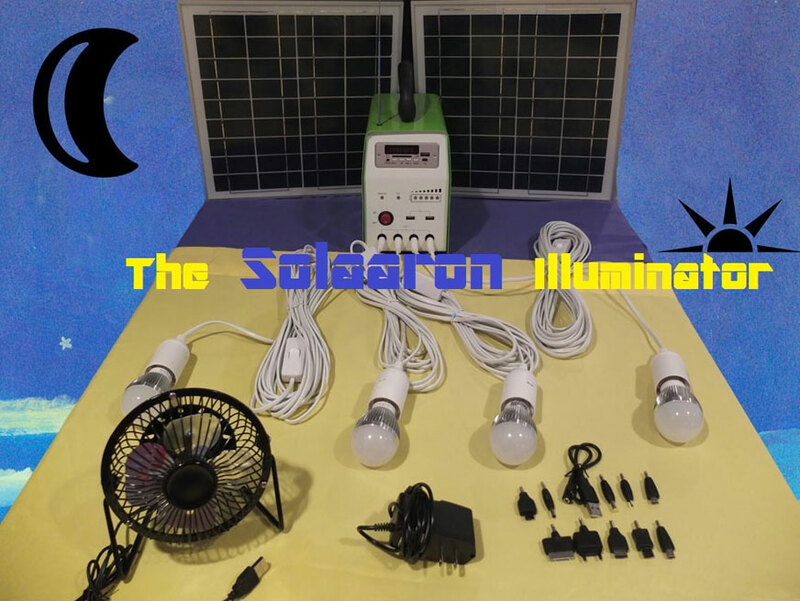 These solar solutions such as the Solaaron "Illuminator" lighting system & power bank dramatically improve upon that age-old "candle drawer", while still performing all those functions in one small item. Integrated into these pint-sized solar generators are multiple energy efficient lights, FM radio, MP3, a Fan as well as USB ports for cell phone and device charging. These units truly offer power on demand, from the built-in high capacity battery that sits inside. The battery stores hours of electricity and is easily recharged with the included wall adapter and/or by the power of the sun through the included mini solar panels.